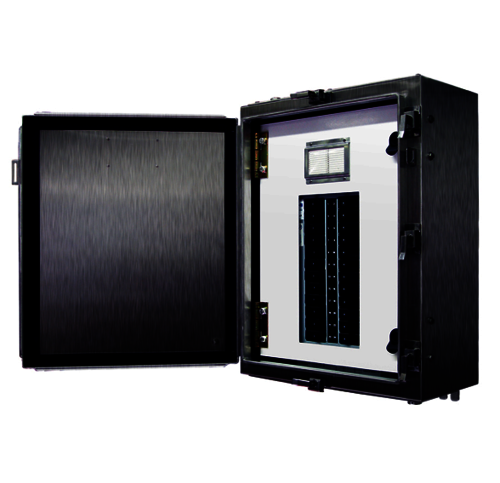 A dead front, swing panel version is available with a swing panel and quick access latches. The dead front, swing panel version isolates the wiring space, wiring gutter, and termination area which would otherwise be exposed when the door is opened. door to be closed with the breaker toggle in any position. GFI/EPD handles are colored green and include external test capabilities. individual breaker in either the “on” or “off” position. • Individual operating labels identify breaker position (on, off, tripped) the circuit number and breaker amperages. • Back Fed Main Breaker Assemblies provided with “Main” Nameplate.